Cats, as independent and freedom-loving as they are, still require our utmost care for them to live their lives to the fullest. One way for them to get really healthy is for us to provide them with the best wet cat food. In this review, we’ll be presenting to you some reasons why only wet or canned cat food is the best for your pet. But before that, let us look first at some of the best cat food brands in the market today and what makes them truly special for the tabbies in our lives. Nobody knows exactly where the famous notion that cats love eating fish comes from, but they sure do. 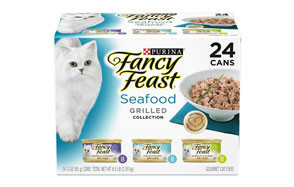 And that’s what Purina’s Fancy Feast Grilled Seafood Collection Wet Cat Food Variety Pack brings to the table for your favorite tabby. Dubbed as the best wet cat food, one can always satisfy the discriminating palates of today’s felines with real meats from tuna, salmon, and other ocean fishes combined with chicken and other high protein ingredients. It does contain wheat gluten, however, so you’d have to be cautious if your kitty is known to be allergic to gluten. 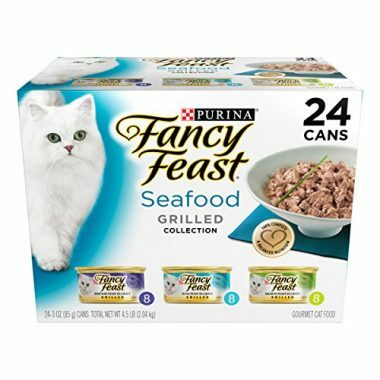 Nevertheless, with substantial amounts of calories and proteins plus as much as 80% of moisture in each can of these seafood feast varieties, whose kitty is not going to grow healthier? 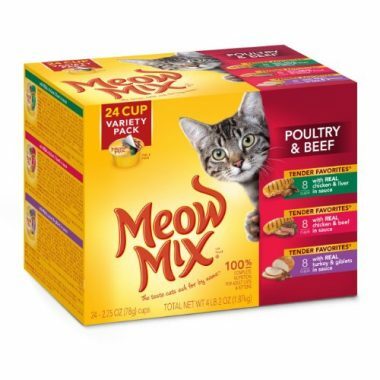 The sauce in this collection of Meow Mix Tender Favorites Poultry & Beef Wet Cat Food Cups in Sauce soft cat food is sure to keep your feline pet licking its bowl. Not only are these kitty chow delectable, they’re highly nutritious, too, providing just the right amounts of calories, proteins, and fats to growing kitties. 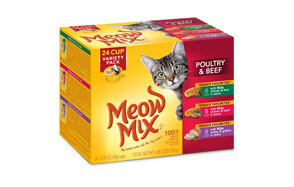 Meow Mix comes with an exceptional blend of premium quality real meats that include some of the feline world’s favorites such as tuna, chicken, and beef. Like the Fancy Feast, however, the Meow Mix Tender Favorites also comes with wheat gluten. Although gluten allergy is quite rare in cats, you should still have to make sure that your kitty is not susceptible to developing gluten allergy before giving it this kind of healthy cat food. 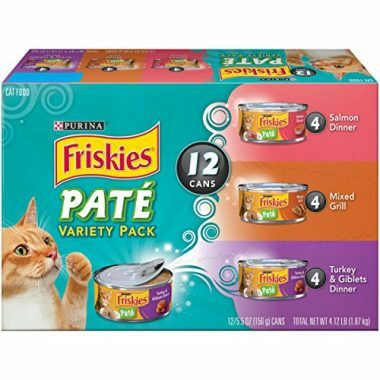 Aside from its Fancy Feast, Purina also provides felines all over the world the Friskies Classic Pate Variety Pack Cat Food, designed specifically for kitties that are still able to somehow drink from their homes. Friskies canned cat food is slightly drier than the Fancy Feast which, as many cat owners say, is a bit saucier. But don’t ever think that the Friskies is less nutritious than the Fancy Feast. As a matter of fact, it packs more than twice the calories contained in the Fancy Feast. This makes the Friskies the cat food of choice of highly active felines or kitties that require substantial amounts of energy, proteins, and fats such as those that are currently recuperating from an illness or even kitties. The Friskies’ higher protein content is perfect for developing healthier bodies among younger kitties. Everyone knows that cats don’t really love eating grains or veggies, for that matter. In the wild, they’re known to be obligate carnivores: it’s meat or nothing. 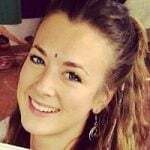 But, we cannot discount the fact that vegetables and fruits contain some vitamins and minerals that we sometimes don’t see in animal products alone. As such, a well-balanced nutrition is also needed by these felines. 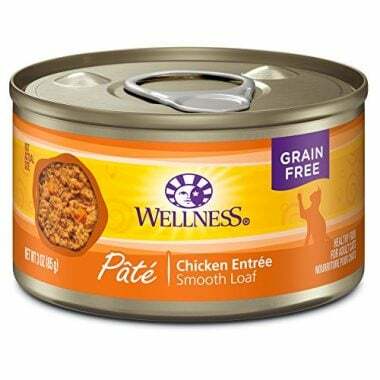 With the Wellness Natural Complete Health Natural Grain Free wet Canned Cat Food in Pate Recipe, your kitty is bound to get the right amounts of animal-based proteins in a truly yummy treat plus all the nutritious goodness of healthy veggies and fruits for a more well-balanced feline nutrition. Omega 3 fatty acids are included to help in the promotion of overall feline health. 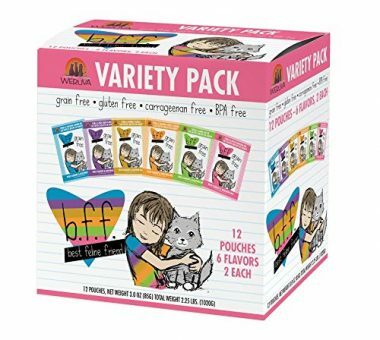 One of the healthiest wet cat food you could ever give to your feline friend is the Best Feline Friend Grain Free Wet Cat Food Cans & Pouches from Weruva. Each pouch contains just the right amounts of energy from a good combination of proteins and fats. But what really separates Weruva from the rest is that it has one of the highest proportions of water or moisture in its formulations, ranging anywhere from 84 to 86 percent of the total food volume. Whereas other soft cat food can only manage at most 80%, Weruva’s high moisture content is perfect for kitties that are especially averse to drinking even from a feline drinking fountain. BLUE Buffalo has always been known for formulating pet food that closely mimics their natural food in the wild. 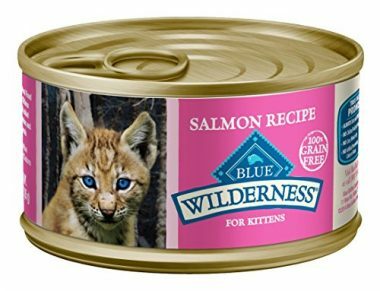 That’s exactly what you get with its Wilderness High Protein Salmon Recipe for Kittens. Considered as one of the healthiest wet cat food, the Blue Wilderness comes with substantially higher proportions of proteins and fats plus just the right amounts of moisture and calories to help ensure the optimum development of kittens. It’s formulated with taurine and DHA, too, both of which are beneficial substances in the continuing development of the young feline brain and eyes. There’s no denying that Purina is one of the best cat food brands in the business. Aside from its Fancy Feast and Friskies healthy cat food product lines, it also comes with the Pro Plan Canned Cat Food that closely resembles the nutritional profile of Fancy Feast. The Pro Plan comes in gourmet entrees, however, making them one of the best when it comes to providing your feline friend a nutritious, fine dining experience in the world of cats. 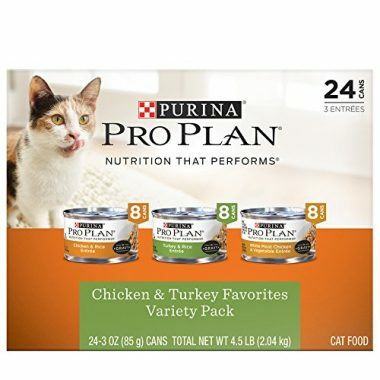 The Pro Plan is available in a variety of flavors including chicken, turkey, and white meat chicken with vegetables, all of which come with rice in a thick, sumptuous gravy that your kitty will surely love. 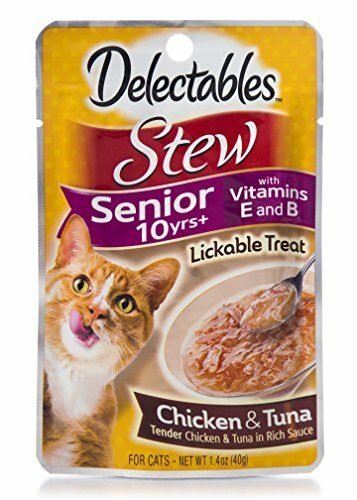 If you have a kitty that is already reaching its golden years, then you have to try HARTZ’s Delectables Stew Senior 10 Yrs+ Lickable Treats. This best wet cat food for senior felines comes with significantly reduced amounts of calories, proteins, fats, and fiber, but with substantially greater proportion of water or moisture. This is a reflection of the changing physiologic needs of elderly cats. The functioning of most of their body organs would have already started declining by this stage. Providing them increased proteins, fats, and fibers may exact unnecessary toll on their kidneys and digestive systems. They do need plenty of water because of the risk of dehydration in the elderly. This is what HARTZ’s Delectables provide, making it one of the best wet cat food specially designed for seniors. 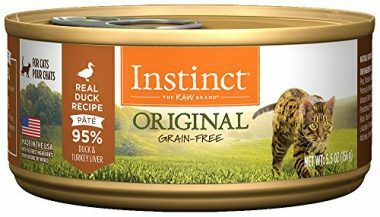 Ninety-five percent of the ingredients packed into every canned cat food of Nature’s Variety Instinct Original Grain Free Recipe are sourced from pure animal proteins and healthy oils. Only 5% are sourced from fruits and vegetables as well as other wholesome ingredients without having to include gluten or grains. This makes the Instinct one of the healthiest wet cat food around. 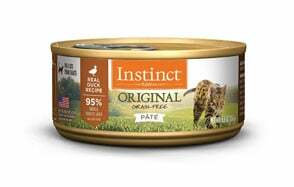 Its near-ideal ratio of essential fatty acids plus the inclusion of other nutrients make this pate something that cats will love. It also has an amazing calorie, protein, and fat profile, although its fiber percentage can be considered quite higher than most. Nevertheless, Nature’s Variety still manages to get our nod as one of the best for your cat. 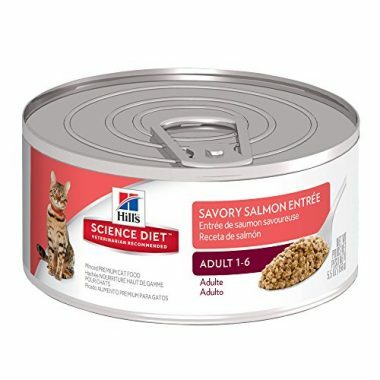 Featuring precision formulated nutrition especially designed for today’s kitties, the Adult Minced Canned Cat Food in Savory Salmon Entrée by Hill’s Science Diet is an exceptional soft cat food that provides the correct balance of proteins, calories, and fats. While it doesn’t list the maximum percentage of moisture present in each preparation of this healthy cat food, it nevertheless lists water as its 1st main ingredient. This is in combination with salmon, pork, and wheat flour. The use of animal-based proteins helps ensure your kitty is able to fully digest these macromolecules. And if salmon is not your kitty’s favorite, you can always try the other flavor variants like chicken liver, ocean fish, turkey, and beef. Buying the best wet cat food used to be a pretty straightforward affair. However, as our knowledge of feline nutrition as well as feline behavior expands, so does our understanding of their unique nutritional needs. What was once a very simple process of picking wet cat food with the best possible ingredients no longer holds true. Here’s a guide for you to help you on that journey to determine the best wet cat food for your feline friend. 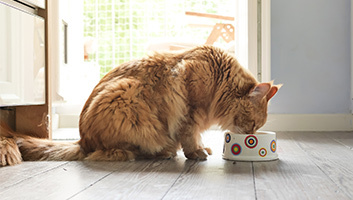 Why is Quality Wet Cat Food Essential to Your Cat’s Health? Like the great divide in the dog world, there is also a polarizing division in the cat world where proponents of either dry cat food or wet cat food have been slugging it out for many years now. We don’t want to sound biased towards the use of wet cat food for our feline friends. So, we’re going to share with you some of the scientific explanations as to why your cat will thrive more on a diet that a has naturally greater moisture content. It’s meat or nothing for our feline friends. The reason for this is not so much that they are choosy, but rather because they need one very particular amino acid to really thrive. Unfortunately, this amino acid can only be found in animal meat proteins. As such, while cats can technically feed on plant proteins, they are at an increased risk of developing a lot of potential health problems because of the absence of this one very important amino acid – taurine. Taurine is an amino acid that plays a very crucial role in the normal and healthy development of your cat’s cardiovascular system, skeletal muscles, its eyes especially the retina, and its central nervous system especially the brain and spinal cord. If you do not feed your feline friend animal-based proteins, then you are risking a whole lot of potential health problems. The digestive systems of carnivores are very short. It is this rather short length of their gut that prevents them from efficiently digesting cellulose- or fiber-rich foods. As such, if you put too much fiber or cellulose into their diet, you’re actually inviting a lot of trouble. Unfortunately, fiber is an essential part of fillers found in dry cat food. Cats don’t have the necessary thirst mechanism to make them want to drink when thirsty. They can only rely on the food they eat for water. The prey wild cats feast on typically contain 70 percent moisture. By comparison, wet cat food contains, on the average, 78 to 83 percent moisture. On the other hand, dry cat food typically contains, at most, 10 percent moisture. So, if cats don’t have an efficient thirst drive and they eat dry cat food that contains a measly 10 percent of the food’s weight, the obvious result is dehydration. This can lead to chronic renal failure or, at the very least, urine crystals can form and obstruct the flow of urine. We already mentioned that most dry cat food comes with substantially greater proportions of carbohydrates which can easily translate to glucose. You already know what this means. Increased glucose coupled with its underutilization can lead to feline obesity culminating in the development of diabetes in cats and its corresponding complications. Based on what we have discussed above, it is now clear what things we should consider whenever we are shopping for wet canned cat food. We’ve summarized the points here for your perusal. While not absolute, this will give you a fair understanding of the composition of the wet cat food in terms of the 4 principal elements: proteins, fats, fiber, and moisture. At the very least, the moisture content should be at least 70 percent with the protein and fats making up mostly the remainder of the food composition. Equally important are the principal ingredients. Pet food manufacturers list their ingredients in decreasing level of importance with the first 5 ingredients occupying 80 to 90 percent of the total volume of the food. As much as possible, the principal ingredients should always include an animal based protein. The more meat proteins listed in the top 5 the better it is. However, it is also crucial to check for the quality of the meat protein. Getting salmon is different from salmon meal although both will come from the same fish. You should not be confused between an ingredient and a nutrient. Ingredients are the actual food items such as chicken, beef, duck, and so on and so forth. On the other hand, nutrients are chemicals derived from food. So, chicken will contain vitamins and minerals as well as essential fatty acids and amino acids. It is important to differentiate an ingredient from a nutrient because the latter is a natural component of the former. It is natural for companies producing wet cat food to use preservatives in their formulation. This is because the ingredients used in each preparation are not dehydrated and as such are subject to spoilage. Now, do take note that there is a great difference between natural and artificial preservatives. An excellent example of a natural preservative is salt as well as Vitamin E. If there is a substance in the label that you don’t understand, it’s okay to research it first. Examples of artificial preservatives you want to avoid include BHA, ethoxyquin, BHT, and propyl gallate. While cats are not known to develop gluten allergies, you might want to confirm this first with your veterinarian and avoid foods that have gluten in them as much as possible if such an allergy exists in your cat. Also, the fiber, ash, and grain content should not be greater than 5 percent of the total volume of the food. Artificial coloring, flavoring, and preservatives should also be avoided at all cost. Also look for fillers such as corn or wheat as these are some ingredients you want to avoid. What Ingredients Should I Look For in Wet Cat Food? If we have to consider the things that we have been talking about so far, we can easily come up with a list of the ingredients that we should be looking for in a wet cat food. Here are the most important ingredients that you have to look for. We cannot stress this enough. Meat protein should always take precedence over any other kind of plant protein precisely because of the absence of taurine in the latter. Additionally, plant based proteins also contain fiber which we already know to be quite difficult to digest by obligate carnivores. It is important to look for a clearly stated meat protein such as chicken, tuna, or duck, just to name a few. If it says ‘poultry meal’ your guess is as good as ours as to what kind of poultry products are included in the food. At the very least you need to go for 75 percent moisture. The higher the moisture content the better it is, especially if you have an elderly feline or a feline that simply doesn’t drink enough water. We already mentioned that taurine is the amino acid that cats can never get from plant proteins. While taurine is naturally sourced from meat proteins it would also be important to look for cat foods that are enriched with taurine. When and How Much Food Should I Feed My Adult Cat? A healthy adult kitty will require, on the average, 30 calories for every pound of its body weight every day. So, if you have a 10-pound kitty, you’re looking at 300 calories to be given every day. But the point is that you are not going to give this amount in just one feeding. Ideally, you may want to divide it into 2 to 3 meals. Let us say you’ve decided to give your 10-pound kitty 300 calories per day in 3 meals, then you’re going to give your pet kitty 100 calories per meal. For example, if a 3-ounce can of wet cat food contains 100 calories, then you are going to give your pet 1 can of this wet cat food every meal, 3 times a day. That also means you will be buying 3 cans of this particular food every day or 21 cans per week or 90 cans in one month. Caring for your pet cat means giving it the best wet cat food you can ever find. These provide the necessary hydration felines need to support their optimum development. You can always start with our list of the best.